Sony has embraced the YouTube phenomenon, but its new camcorder is little more than a webcam. It's one thing for lithe, innovative firms like LG and Casio to embrace the web's most pervasive video phenomenon, but quite another when a company as fuddy-duddy as Sony tries to sell a YouTube-optimised video camera like its new NSCG1 . The Net Sharing Camcorder, as Sony has clumsily branded it, is really a very simple device that offers little more than most digital still cameras or even high-end cameraphones. Even so, the slick, angular design may win over a few folk keen for even simpler ways of getting VGA 30 frames-per-second videos of their cats chasing cotton reels online. 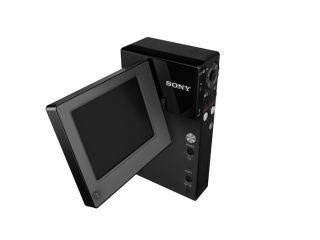 Nonetheless, there are some merits in the form of software for uploading videos directly to YouTube, 5-megapixel still shots, a 2.4-inch flip-out monitor and video output suitable for playback on a PSP. However, at $200 (£99), the camera also seems a little overpriced for what is essentially a USB webcam - another feature Sony touts in its advertising. The NSCG1 will be available in the US in September and worldwide soon after.